The Wonder Woman Epilogue video has a secret mission for Steve Trevor's (Chris Pine) boys. Lucy Davis' Etta Candy is back, and she means business. An obvious fan-favorite, Etta has special instructions that could tie into the Mother Boxes that will be at the heart of Justice League and the story it will unspool this November. Wonder Woman arrived to much acclaim this past June, and skyrocketed to $400 million at the domestic box office. It continued making waves all summer, with most praising it for a variety of reasons. 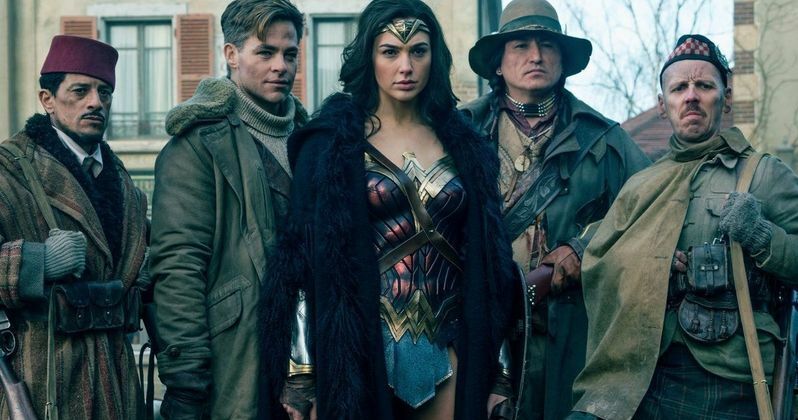 The movie helped push the DCEU past $3 billion at the worldwide box office. And it has turned Patty Jenkins into a household name, while also cementing her status as the highest grossing female filmmaker of all time. Many are eagerly awaiting the movie's presence on Home Video, so they can obsessively watch all the action and excitement over and over again. But also for the special features it will be packing, which provide a deeper dive into this DC superhero world. There will be plenty of featurettes and commentaries from all involved. There will also be some never-before-seen moments, one of which is this aforementioned epilogue that ties things up quite nicely. Here we see Steve Trevor's team back at the bar with Diana Prince's WWI allies. She has Etta deliver a new top secret mission for them. She goes onto say this about what lies ahead. "The war is over, but the good fight goes on. After the bombings in Liège along the western Belgian front, the powers at be found something. t's very old. It's very powerful. They want us to recover the artifact and deliver it to the Americans. I mean, we don't want it in the wrong hands, do we?" There is no direct confirmation from anyone at DC Films that they are talking about the Mother Boxes. But what else could it be? The miniaturized, portable supercomputers originated on Apokalips. In Justice League, Cyborg's origins, which are directly tied into the Mother Boxes will be further explored. Victor Stone's (Ray Fisher) dad will use one of the boxes to resurrect his son as Cyborg. Who is said to bring 'the heart' to Justice League, which is the next DC movie hitting theaters. This epilogue provides a nice connection between the two. It is possible that this epilogue scene is quite integral to the storytelling fabric of the DCEU. And it should be handled with care. It has been confirmed that Justice League will pick up just moments after Batman V Superman ended. The storyline takes place decades after Wonder Woman. But she looks as fresh as ever on her next mission. And reshoots are rumored to give Gal Gadot a little more screen time. So don't be disappointed that you don't see her here. Take a look as Etta's Boys prepare for what could be their most dangerous mission yet.